Rarely has a flagship phone been so thoroughly leaked ahead of launch as Google’s Pixel 3 XL, but the company still had a few surprises in store at its New York event. The Google Pixel 3 and the Google Pixel 3 XL offer some significant upgrades over their predecessors, while still clearly belonging to the Pixel family. On top of the usual processor upgrade, both Pixels now sport a dual-lens, front-facing camera designed to elevate your selfie game to the next level, some additional software smarts to get the best from the single-lens main camera, and support for Qi wireless charging. Google’s design has also been refined compared to last year’s Pixel 2 and Pixel 2 XL. If you’re in the market for a new Android phone, Google’s wares should be on your radar. Here’s everything you need to know about the Pixel 3 and 3 XL. One of the most interesting new features to be shown off during the launch of the Pixel 3 was the ability for the phones to screen phone calls and block spam. When you get a call from an unknown number, for example, you can simply hit the “Screen Call” button, and Google Assistant will talk to the caller instead of you. The feature will be available on the Google Pixel 3 and Pixel 3 XL later this month, and will be coming to the original Pixel and Pixel 2 in November. The Google Pixel 3 XL may be getting good early reviews, but there is one feature that reviewers have consistently mentioned in a less-than-positive light — the huge notch. Thankfully, however, it seems as though Google is developing a way to hide the notch. The new feature is currently available in Android’s developer options and essentially puts a black bar at the top of the display. The result is that the phone basically looks like it has a large bezel at the top, though some may prefer that look to the notch. We tried out the new feature and you can see what it looks like below. Perhaps the most interesting addition to the Pixel’s software is that it will be getting Google Duplex, Google’s ultra-realistic human-sounding version of Assistant that can call restaurants to make bookings. For now, the service will only call restaurants that don’t have online booking systems, which already have Assistant support. Initially, Google is only bringing the feature to New York, Atlanta, Phoenix, and the San Francisco Bay Area — though it’s likely the feature will roll out to more areas soon after. At first glance the Google Pixel 3 looks a lot like the Pixel 2, but look closer and you’ll see that Google has cut the bezels down, enabling it to pack a 5.5-inch OLED screen into a body that’s actually a hair smaller than its predecessor’s. Not only has the screen size jumped by half an inch, but it’s also sharper, with a 2,160 x 1,080-pixel resolution that scores it a respectable 443 pixels-per-inch (ppi). Thankfully, there’s still room for stereo front-facing speakers. Flip around to the back and we find the same two-tone design as previous Pixels, with a fingerprint sensor in the middle and the camera lens at the top left, but this time the back is all glass, which allows the Pixel 3 to support wireless charging. Alongside the usual understated black version, there’s also white with a mint green power button, and an all-new “Not Pink” option with an orange power button. There are no real surprises inside, where we find Qualcomm’s Snapdragon 845 processor backed by 4GB of RAM. Storage options are 64GB or 128GB and there’s no room for a MicroSD card to expand on that. There’s also no room for a 3.5mm audio jack, so you’ll have to make use of the USB-C port or Bluetooth 5, but you do get USB-C earbuds in the box. Naturally, the Pixel 3 runs the latest Android 9 Pie version and Google has added various enhancements. In addition to Qi wireless charging, there’s also fast-charging support for the 2,915 mAh battery. That’s slightly bigger than the battery in the Pixel 2 and, coupled with the newer, more efficient processor, should translate to longer battery life. The Pixel 3 XL is more obviously different from its predecessor, with a large notch making a controversial appearance at the top of the 6.3-inch OLED screen. It also retains a sizable chin below. The display sports a resolution of 2,960 x 1,440 pixels, which translates to a sharp 523 ppi. The screen is flanked by stereo front-facing speakers. Just like its smaller sibling, the Google Pixel 3 XL has a two-tone design on the glass back, with a fingerprint sensor in the middle and a single camera lens at the top left. It also comes in black, white with the mint green power button, and in the new pink color with an orange power button. The Qualcomm Snapdragon 845 processor is backed up by 4GB of RAM and there’s 64GB or 128GB of onboard storage, with no expansion option. You won’t find a 3.5mm audio jack here, but there are USB-C earbuds in the box and support for wireless headphones via Bluetooth 5.0. The battery is rated at 3,430mAh, which is actually a touch smaller than last year’s Pixel 2 XL battery, but we expect power efficiency improvements to help keep it running for a day. There’s also support for Qi wireless charging and fast charging. The most exciting upgrades in the Google Pixel 3 and 3 XL are to be found in the camera department, and both phones have exactly the same camera setup. Google has stuck steadfastly with a single-lens main camera rated at 12.2 megapixels, even in the face of dual- and triple-lens competition. We don’t blame it, as the camera in the Pixel 2 and 2 XL has held its own very well over the last year — in fact, it’s still our reigning camera phone champion. The main camera has optical image stabilization, laser autofocus, dual pixel phase detection, and support for high dynamic range (HDR). Google is able to squeeze such great performance out of its camera by employing some clever software trickery, instead of relying upon more hardware. The A.I.-powered camera in the Pixel 3 and 3 XL takes a burst of shots before and after you press the shutter button and then analyzes them to suggest the best options, looking for shots where subjects are looking at the camera with open eyes and smiles. It also offers an excellent portrait mode capable of blurring the background for the perfect bokeh, and it’s capable of automatically tracking subjects, so you don’t need to keep tapping to refocus. There’s a new zoom option that allows you to zoom in, even without a telephoto lens, with A.I. filling in the gaps and bringing you the detail level you want. The front-facing camera features a bigger upgrade, combining an 8.1-megapixel telephoto lens with an f/1.8 aperture and a second 8.1 megapixel wide-angle lens that features an f/2.2 aperture. This combination will enable you to capture great group selfies or get more background in, and it should also perform well in low light, making it perfect for grabbing shots at night or indoors. Just as it did with previous Pixel phones, Google is offering free, unlimited Google Photos storage for all the full resolution photos and videos you take with the Pixel 3 or 3 XL. Both the Pixel 3 and Pixel 3 XL run Android 9.0 Pie. They ditch the old home, back, and recents buttons in favor of the new gesture navigation. From next month, Google Assistant will be enhanced with the ability to screen spam calls, answer for you, and provide a transcription so you can decide whether to block them or call back. The new Pixels will also be the first to get the ability to make calls for you and perform tasks like make restaurant reservations. 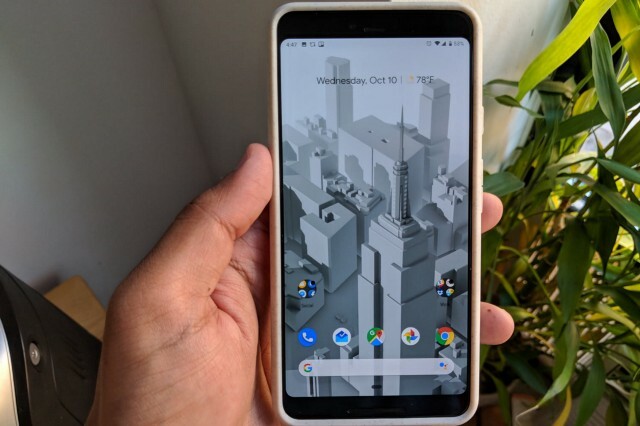 If you use your Pixel 3 or 3 XL with the new Pixel Stand, then you’ll also get special one-touch shortcuts or voice commands to enable you to check your schedule and more. The Google Pixel 3 starts from $799 and the Pixel 3 XL starts at $899. If you want the higher 128GB storage capacity of either, it will cost you an extra $100. They are available for pre-order now and will ship starting October 18. We offer timely analysis and in-person experiences that form the basis of our professional articles. Our editorial section is a reflection of the emerging technology trends — ranging from the internet to desktop, startups to big companies, security, open source and more. Our tagline “Hub Bytes of Technology and More” tries to address the same diversity.